The Galleries Committee hangs at the Nye County Courthouse, the Pahrump Community Library, Bank of America and American First National Bank. These galleries host themed exhibits featuring works of art by PAC members. Themes are chosen by the Galleries Committee and are published in PAC’s ArtBeat. Previous themes have included Animals, Black & White, What I did on my Summer Vacation, Patriots, Western and more. In the past, PAC has also hosted Nevada Arts Council traveling exhibits at the Nye County Courthouse complex. Professionally installed, these exhibits are part of the NAC Touring Initiative which provides arts experiences to under-served areas of the state. Nye County Courthouse Gallery, 1520 E. Basin Avenue, Pahrump, NV. Bank of America, 750 S. Highway 160, Pahrump, NV. American First National Bank, 3340 S. NV Hwy 160, Pahrump, NV. 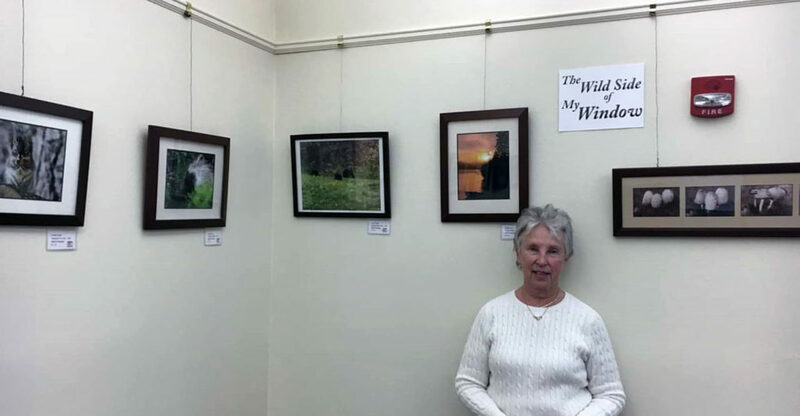 Loretta Lindell with her photography exhibit, “The Wild Side of My Window” at the Reader’s Nook December 14 – February 22, 2019. The Gallery in the Pahrump Community Library is located at 701 East Street, Pahrump, NV in the Reader’s Nook. It is managed by PAC’s galleries committee and usually features one-man shows of local artists and PAC members 4-5 times a year. 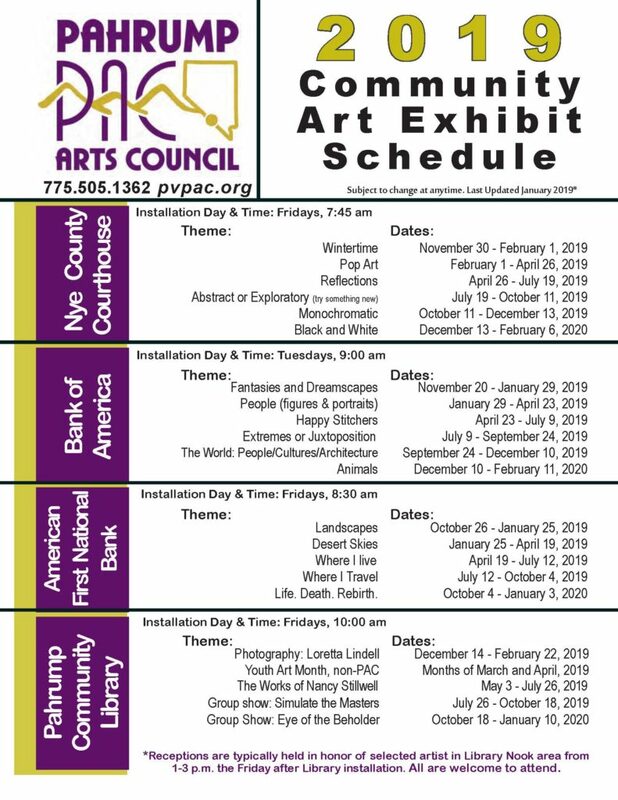 If you are interested in exhibiting your work please view the schedule and guidelines 2019 PAC Community Exhibit Schedule or contact the PAC Galleries Committee for more information.